It was a family trip to Chinatown that Ricky Lee would never forget. The family was packed into the car, driving through Chinatown when his dad spotted Frankie. “Hi,” Lee’s father said from the car window. Frankie split, and his father, Herbert “Herb” Lee, put the car in reverse, chased Frankie through Chinatown and then ditched the car to pursue him on foot. When Herb caught up to Frankie, he wrestled him to the ground and kept him there until his fellow SFPD officers arrived. Herb joined the department in 1956. He died Nov. 1, after suffering from colon cancer, at the age of 84. 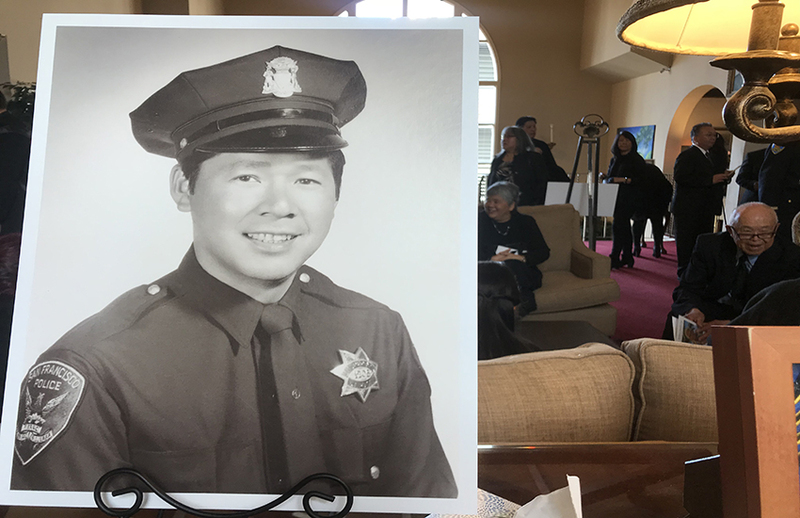 He will long be remembered as the first Chinese American officer to join SFPD’s ranks, and someone who spearheaded efforts to diversify the force. Lee Fewer recalled an incident that started outside her Uncle Herb and Aunt Dot’s house as a young girl. 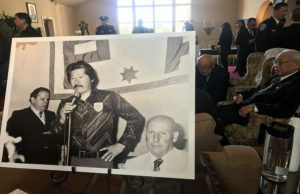 Herb joined the force after serving two years in the U.S. Navy, and only one year after the SFPD disbanded a “Chinatown Squad” that had been established in the early 1880s to stop gangs, gambling and prostitution in Chinatown. Chinese Americans felt the unit was “an affront to Americans of Chinese descent,” according to the Chinese World newspaper. It was a white police force going after a community already having a hard time in the U.S.
Also during that time, many working-class Chinese people were forced to take low-wage, menial jobs in Chinatown because of their limited English proficiency. Chinese people kept their heads down and worked day in and day out at these types of jobs, but not Herb. It is unclear what gave him the idea of joining the force, but doing so, and his recruiting efforts, changed the ranks. A photo of Herb Lee singing. The late SFPD sergeant loved to sing and produce his own music. Photo by Kaitlin Benz. Today, whites represent 49 percent of the nearly 2,000 officers and 48 percent of the city’s population. Asian and Latino officers each account for 16.5 percent of the officers. Asians make up more than 33 percent of the city’s population, and 15 percent of residents are Latino, according to the U.S. Census. Herb served in a rapidly changing city. “The pages in his personnel file read like a work of fiction,” said SFPD Deputy Chief Michael Connolly, who spoke at Herb’s memorial service. Connolly was a police cadet with the Police Activities League, a volunteer organization, one that Herb led, that connects San Francisco youth with police officers through sports and recreation. On another day in 1959, Herb, again off-duty, sprang into action when he witnessed a robbery in progress and apprehended the robber. That incident won him the Silver Medal of Valor and a captain’s commendation. He worked on multiple teams over the years, spending some time undercover investigating gangs, working in the juvenile division and taking over as the executive director of the Police Activities League. He was promoted to Sergeant in 1980. Many of Herb’s former Police Activities League cadets grew up to embark on their own law enforcement careers because of him. At his memorial service in November, others spoke about Herb’s service to underserved communities. He mentored young men and women through his love of fishing. He took many young people to the San Francisco Bay on his boat, the “Ah Choo,” in his years as an officer. It was his way of introducing underserved communities to good community policing. Jimmy Huey, a family friend, first met Herb when he was 14 years old. Herb took him on the Ah Choo and taught him to fish. They fished together for the next 45 years, Huey said at a recent memorial for Herb. They always evenly split the amount of fish they caught. If there was extra, they settled the score like men — rock, paper, scissors. “Or as we would say in Chinese, ‘caang4 caang4 dou1,’” Huey said. Lt. Gavin McEachern said every single person Herb took on the Ah Choo was treated like his own child. Commander David Lazar, who is now in charge of the SFPD’s Community Engagement Division, met Herb in 1984 as a Police Activities League Cadet. “The newly relaunched Police Activities League fishing program will be renamed to the ‘Sgt. Herb Lee PAL Fishing Program,’ and we will set sail with 100 kids this spring,” said Lazar. Besides fishing, Herb’s other passion was music. You know he really liked you if he gave you one of his homemade CDs, and if you liked the first one there was no doubt that he would follow up by giving you another, and another, and another, many at the memorial service said. Herb produced more than 30 CDs with his original music. His son said he would sit in his living room chair and make copies of his CDs all day long, watching TV and copying CDs over and over until he had 500 copies. His wife would design, print and stick a label on each CD case. Mel Lee met Herb in the 1950s. They were close friends who loved to golf together. Herb, he said, would always bring a plastic bag with him to golf so he could collect trash on the fairways as they played. Mel Lee ended his speech at the memorial by passing out CDs to Herb’s loved ones, who were sitting in the front row. The room burst into laughter. It was exactly how Herb would do it.